Synthetic peptide corresponding to Human nNOS (neuronal) aa 1411-1425 (phospho S1417). Our Abpromise guarantee covers the use of ab5583 in the following tested applications. WB Use a concentration of 2 µg/ml. Predicted molecular weight: 160 kDa.Can be blocked with Human nNOS (neuronal) (phospho S1417) peptide (ab41773). 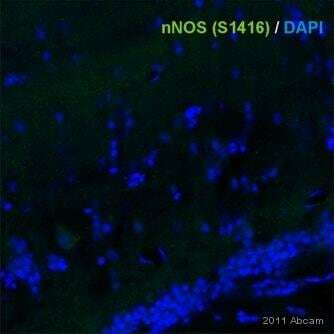 ab5583 staining nNOS (phospho S1417) in Mouse brain tissue sections by Immunohistochemistry (IHC-Fr - frozen sections). Tissue was fixed with formalin, permeabilized with 0.25% Triton X-100 and blocked with 3% serum for 1 hour at 22°C. Samples were incubated with primary antibody (1/500 in PBS + Triton X-10 + normal donkey serum) for 48 hours at 4°C. 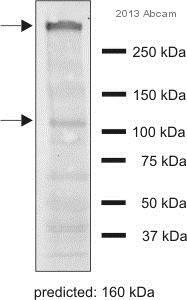 A Biotin-conjugated Donkey anti-rabbit IgG polyclonal (1/10000) was used as the secondary antibody. Immunocytochemistry/Immunofluorescence analysis of nNOS (neuronal) (phospho S1417) (green) showing staining in the cytoplasm and nucleus of SH-SY5Y cells treated with 100 ng/ml nocodazole (left) and untreated SH-SY5Y cells (right). Formalin-fixed cells were permeabilized with 0.1% Triton X-100 in TBS for 5-10 minutes and blocked with 3% BSA-PBS for 30 minutes at room temperature. Cells were incubated with ab5583 in 3% BSA-PBS at a dilution of 1:20 and incubated overnight at 4ºC in a humidified chamber. Cells were washed with PBST and incubated with a DyLight-conjugated secondary antibody in PBS at room temperature in the dark. F-actin (red) was stained with a fluorescent red phalloidin and nuclei (blue) were stained with Hoechst or DAPI. Images were taken at a magnification of 60x. Publishing research using ab5583? Please let us know so that we can cite the reference in this datasheet. 3) What was the lysis buffer? Thank you for this information. Based on your protocol I think increasing the amount of primary antibody you use would improve your result. We recommend using 2 ug/ml, which would be 1/500. I would try using this (or even 1/250) overnight at 4 degrees. The GAPDH will be much more highly expressed than the phospho nNOS so I am not surprised that it is showing a good band. Please let me know if you are still having difficulty. Thanks for the information. We purchase on Fridays, so we would purchase ab5583 this Friday. Would I then send you some kind of confirmation to be sure that I will get the code? I am very pleased to hear you would like to use ab5583 in WB and send us an image of your results. This code will give you 1 free primary antibody before the expiration date. To redeem this offer, please submit an Abreview with the image for WB and include this code in the Additional Comments section so we know the Abreview is for this promotion. Please remember that submission of the Abreview is sufficient for the discount code to become active. I have a quick question: if I submit an a review with picture for ab90443, having already purchased that antibody, can I still take advantage od this deal? If you have purchased ab90443 within the last month and are able to submit data in ICC, I am able to issue a code retroactively. However, you will not be able to use this code to obtain ab5583 to test it. You must purchase the antibody to be tested in order to receive a valid code. I hope this information is helpful. Please let me know and I will issue the code for ab90443 and/or ab5583. I would like to test ab5583 and submit a WB image. Also, I would be interested in testing ab90443 for ICC. Thank you very much for your interest in ab5583 and ab90443. We do not currently have an image of ab5583 in WB and ab90443 has not been tested in ICC. Therefore, I can offer a discount off a future purchase if you buyab5583 and/or ab90443 now, use it in WB, ICC and submit an image of your results to us in the form of an Abreview. The discount would be to the value of 1 free primary antibody. It doesn't matter whether the result is positive or negative, we would just really like to receive your feedback. Of course, if the results are negative you will be covered by our Abpromise guarantee and eligible for a refund or replacement. 1. Reply to this e-mail to let me know that you would like to proceed and send an image of ab5583, ab90443 in WB, ICC. I will then send a discount code. This code must be issued before purchasing so please wait for my reply before ordering. 2. Purchase ab5583, ab90443either by phone, fax, or online (www.abcam.com). 3. Use it in WB, ICC. ab5583 not working in WB with human and mouse brain samples. One previousvial has worked well. Tried this new vial once, it has not worked. Thank you for your telephone enquiry this afternoon. I am sorry to hear you have had difficulty obtaining satisfactory results from the current vial of this antibody. I appreciate the time you have spent in the laboratory and understand your concerns. It is regrettable the results have not been successful. As discussed on the telephone, I would like to reassure you that this antibody is tested and covered by our guarantee for WB and mouse. Before deciding how to proceed, I would like to investigate this particular case further for you, and also obtain some further information for our quality records. In order to do this, I have enclosed a questionnaire below. I would appreciate if you could complete this. It will help you put the information we require together very easily. I would also appreciate if you are able to provide images, including molecular weight markers, from the vials that have and have not worked, this will be helpful for our investigations and assessment of the results. Optimization attempts (problem solving) How many times have you tried the Western? Do you obtain the same results every time? Yes No e.g. are the background bands always in the same place? Image: We would appreciate if you are able to provide an image (including molecular weight markers) which would help us to assess the results. I would like to test ab16650 and ab5583 in IHC using electric fish samples. I am very pleased to hear you would like to accept our offer and test ab16650 and ab5583 in electric fish. This code will give you 1 free primary antibody before the expiration date. To redeem this offer, please submit an Abreview for electric fish and include this code in the “Additional Comments” section so we know the Abreview is for this promotion. For more information on how to submit an Abreview, please visit the site: www.abcam.com/Abreviews. Remember, we publish both positive and negative Abreviews on our datasheets so please submit the results of your tests. The code will be active once the Abreview has been submitted and can be redeemed in one of the following ways: 1) Call to place your order and mention the code to our customer service department; 2) Include the code in your fax order; 3) Place your order on the web and enter the promotional code. Any feedback that you can provide will be greatly appreciated, whether positive or negative. If you have any further questions, please do not hesitate to contact us. We look forward to receiving your Abreview and wish you luck with your research. The terms and conditions applicable to this offer can be found here: www.abcam.com/collaborationdiscount.